The life of a traveling salesman is a constant adventure: seeing the beautiful American countryside, staying in it when your car breaks down, and subsequently MacGyvering your way around the farmer's daughter's booby traps in search of her actual boobies. For duds from a guy who had enough of the road, check out Chillers Showroom. 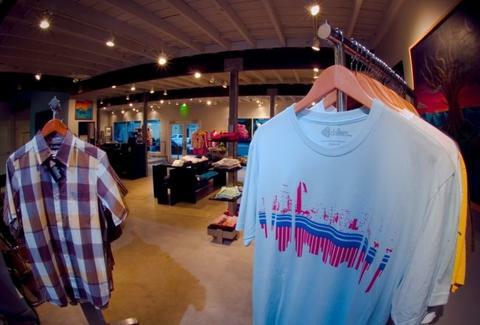 From a La Jolla local who'd previously been roaming the States to peddle Chillers-brand, artist-sourced designs at fashion trade shows, the just-opened Showroom's a semi-industrial retail shop rocking exposed beams, sheet metal molding, and a lounge with a flatscreen and stocked mini fridge that'll ensure you can't buy the same sized tee as when you walked in. In addition to a huge selection of internationally designed tees, a screen-printer enables on-site customer tweaking/production: choose from six tee colors, 11 dyes, and designs like a street art photo by a NY guy called "Brooklyn", and a pair from a South African dude -- one abstractly depicting a lady's face sticking out of the surf, and another slightly more upright and dry gal, which're titled "Infinite" and "More So" respectively, which everyone knows should be "Infinity + 1". They've also got a small selection of insanely affordable short/long sleeve button-down plaids, and heavier coverings like military-esque zip-up sweaters, striped hoodie sweaters in multiple colorways, and a brown, quad-pocketed short trench with distinctive black cuffs -- also what 1/2 of people interested in buying trenches wind up in anyway. For your lower extremities, they've got shorts coming soon, and are rolling out jeans from Good Society, also a traveling salesman's sentiments of our fine countryside before his encounter with inappropriately placed razor blades.